If you have just found out that you have a lung disease of some kind, and that your ability to breathe is limited or impaired in some way, you probably have a lot of questions. Whether you knew this was coming or not, your diagnosis has likely introduced you to some new vocabulary and information from your doctor. As with any medical condition, it can be very confusing at first. However, it is important to fully understand your diagnosis, the types of lung disease you have been diagnosed with and what you need to do to begin treating your particular disease. You may have known your doctor for years, but a pulmonologist has a lot of experience with lung disorders and can probably give you better information about what is going on inside your lungs. Read everything you can find about your disease. Figure out how your lung disease will affect your life, your job and your family. Look into all the treatment options that are out there, and understand what is involved with each before choosing one (or more) with your doctor. Take comfort in the fact that you are not alone. More than 35 million Americans are living with different types of lung disease right now. As frightening as your diagnosis can feel, living with lung disease does not require you to stop doing the things you love. While very serious and usually chronic, you can still lead a full and active life with lung disease if you approach your treatment in a positive way, and make the necessary changes to your lifestyle. Treatments like oxygen therapy may require some adjustments at first, but many people just like you are finding ways to reclaim their independence because of successful treatments. Here is some information about obstructive lung disease and restrictive lung disease, and what each diagnosis can mean for you and your life. Obstructive lung disease and restrictive lung disease are two different types of lung disease, each of which cause difficulty breathing. Here are the differences between obstructive and restrictive lung disease, as well as how they affect you. Just like it sounds, obstructive lung disease involves an obstruction in your air passages, which then impacts your lungs’ ability to exhale air properly. Obstruction is caused by inflammation or swelling in your airways, causing your airways to narrow in reaction to external irritants, or to become blocked altogether, resulting in an inability to fully expel the air in the lungs. Obstructive lung diseases include Chronic Obstructive Pulmonary Disease (COPD), which includes emphysema, chronic bronchitis and asthma. Restrictive lung disease, on the other hand, involves a reduced lung capacity so that the lungs are filled less during inhalation than they would normally fill. This can be caused the loss of functional lung tissue, stiffness or scarring which results in the impairment of the lungs’ ability to expand when inhaling, neurological factors or an enlarged abdomen. The result is the inability to take a full breath and less efficiency in transferring oxygen and carbon dioxide between your bloodstream and your airways. 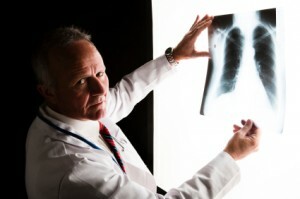 Lung cancer, pulmonary fibrosis and pneumonia are several kinds of restrictive lung diseases. Symptoms of both obstructive and restrictive lung disease can cause shortness of breath and anxiety, as well as a persistent cough, faster breathing rate and weight loss. Obstructive lung disease may also cause wheezing and increased mucus production, along with the inability to expel the air in your lungs. Restrictive lung disease, on the other hand, can make you feel like you cannot get a full breath. Regardless of the symptoms you experience, both types of lung disease make it difficult to breathe efficiently and easily. Now that you know the basic differences between obstructive and restrictive lung disease, it is important to understand that these diseases can be managed and treated. With the right treatments and adjustments to your lifestyle, you can ease your symptoms and, in many cases, slow the progression of your disease. Talk to your doctor about how treatments like medication, pulmonary rehabilitation and oxygen therapy can help improve your quality of life. Supplemental oxygen has been shown to be helpful with both obstructive lung disease and restrictive lung disease, and Inogen portable oxygen concentrators can help make oxygen therapy work with your life. Inogen believes that supplemental oxygen should help you continue to live your life as normally as possible, so our portable oxygen concentrators are easy to use and compact enough to move with you. Your oxygen therapy does not have to hold you back. Contact Inogen today and find out how our portable oxygen concentrators can help improve your freedom, mobility and independence, no matter which types of lung disease you have been diagnosed with.